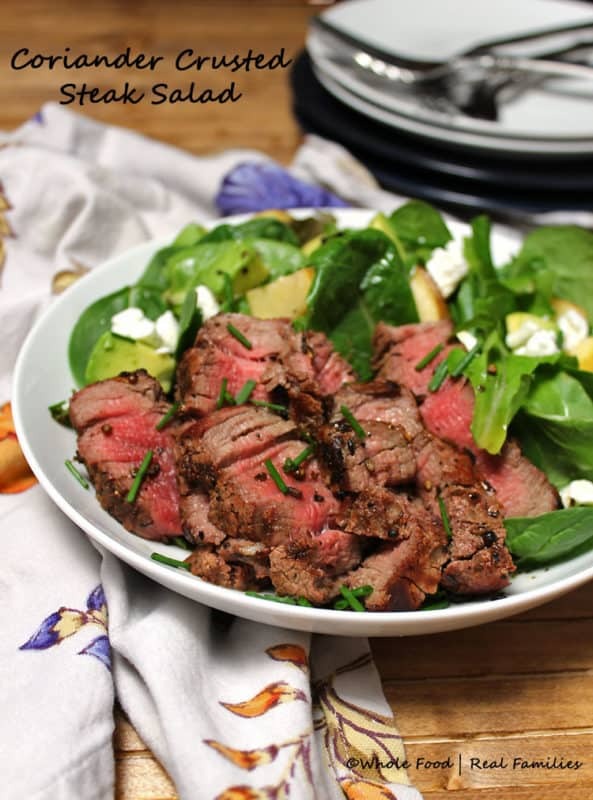 Coriander Crusted Steak Salad is flavorful and cooks and assembles quickly. Perfect with steak hot from the grill or use up leftover steak from previous meals. While we make exceptions around here for special occasions and ice cream, we generally try to eat nutritious meals with varied ingredients from all the food groups. When the Beef Checkoff invited us to Build a Healthy Plate with Beef, we were happy to join them. High quality beef is a part of our weekly meal plan because of the nutrition it provides. The advantage to this particular recipe is that it is on the table in less than 30 minutes, making it perfect for a weekday meal. 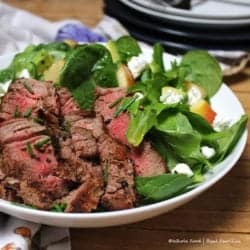 There is really nothing that will make my family dance their way to the dinner table more than a steak – and their favorite is this Coriander Crusted Steak Salad. And by dance, I really mean run – and throw elbows and step on each other so that they can get to the table first. This salad is so flavorful, so delicious that I don’t think my family actually realizes that they are eating lots of leafy greens, fresh fruit, and a little dairy along with their coveted steak. This Coriander Crusted Steak Salad assembles so quickly with the steak coming in straight from the grill. I hesitate to admit how often we cook the steak as a meal on the weekends, adding extra steaks to the grill with the advance plan to use them in salad for later in the week. Of course, to make this plan work, you have to leave the extra steaks in the kitchen and store them in the fridge before anyone sees them. I prefer to use filet of sirloin for this salad. The cut is actually pretty difficult to find at our local grocery store but my butcher will happily cut it for me. I like the filet of sirloin because it is SO very tender – nobody want to struggle with tough steak when you are trying to eat a salad. Its tenderness is similar, I think to a filet mignon but with a MUCH beefier flavor. You can see in the pictures that this steak is so tender you could pull it apart with your fork. Avocado Crostini with Beef and Eggs. Looking for more beef recipes? 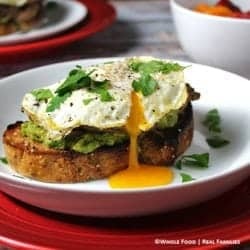 Check out this Avocado Crostini with Beef and Eggs. 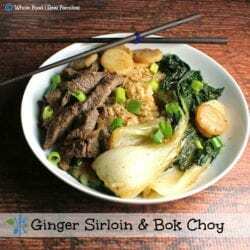 Or this Gingered Sirloin with Bok Choy. Both recipes are so fast to prepare and beyond delicious! If you are looking for information about how to choose lean cuts of beef, this is a helpful guide. If you would like more recipes using beef as the star ingredient in your healthy plate, follow this Pinterest board for inspiration. Or follow the Beef Checkoff on social media: Facebook, Twitter, Pinterest. Preheat grill or smoker to medium high heat. Combine spice rub mix and crush with a mortar and pestle (a rolling pin is a handy substitiute). Combine vinaigrette ingredients in a bowl and whisk until emulsified - or add ingredients to a Mason jar and shake until emulsified. Pat steaks dry with a paper towel. Brush with olive oil and sprinkle spice mix generously onto both sides of the steak, patting gently so it sticks to the steaks. Cook steaks on the grill following your manufacturers directions until they reach your preferred internal temperature. (For this salad, we prefer the steaks medium rare at 135 degrees.) Remove from grill and allow the steaks to rest. While steaks are resting, assemble greens, with diced apples and avocados into 4 large bowls. Slice steaks into strips and lay across salads. Top with goat cheese and vinaigrette. Serve and enjoy! This looks like a fantastic salad! I love the spices that you used in the rub! I LOVE steak salads! And great tip about the filet of sirloin! 🙂 I will be sure to ask my butcher for that the next time steak salads are on the menu here. This looks mouthwatering and I’d love it if it were on my table this minute! Warm beef with greens is my favorite kind of salad! Now THIS is my kinda salad! Cooking with beef is so quick and easy and it goes great with salad. Love this recipe and the wonderful flavors you incorporated! I can’t blame your daughter – I also would prefer steak to a sandwich 🙂 Especially when it’s perfectly cooked like yours is! Yum! Your rub is to die for. I adore the spices you choice. What a fantastic weeknight supper. 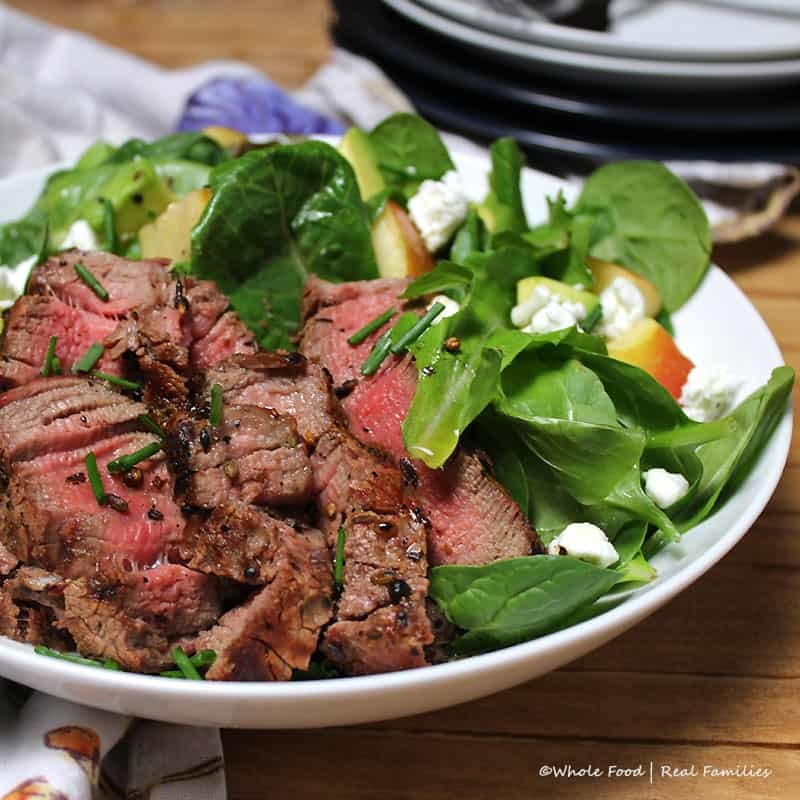 Now this is my kind of steak salad with lots of great flavors and homemade dressing. I love a good steak salad! Wish we were neighbors because I would totally invite myself over! I love a good steak salad! Your photos are amazing I want to bite my screen!